When Naruto first began airing on Toonami in America in 2005, I was growing a bit weary of all the changes that were taking place on Toonami. Indeed, I kind of associate Naruto (as well as the post-Cell Games sagas of Dragonball Z) with the downfall of Toonami and my temporary disassociation with anime in general. So while I did like certain elements of this show and enjoyed it for a while I eventually just stopped watching it. Part of that had to do with a long break from cable TV (and anyone can tell you that once you miss a few episodes of anime then you will have no idea what's going on unless everything you miss just happen to be filler episodes), but part of it was just growing up, I guess. With shows like Naruto, Bleach, Dragonball Z, and Inuyasha it is certainly plausible that you could miss a lot and still not lose the story because of excess filler, but the stuff I missed in Naruto seemed kind of important. Oh, well. I just stopped watching it at around episode 100 or something like that. The length of the shows was another thing. I was the same way with Yu Yu Hakusho and Dragonball Z and InuYasha, too. There came a point where I just stopped watching 'em because they kept going on and on and on. By the time Bleach came around in 2006 I was already done with anime for the moment and didn't even bother watching that one for more than a dozen episodes because it just looked like one of those that would go on forever. I was right on that assumption. One of the perks of my premium Crunchyroll accounts is that I get to stream all 220 episodes of Naruto. While just anyone can watch the ongoing sequel series Naruto: Shippuden on CR, Naruto is reserved for premium members only. So I figure why the hell not go and see what all I missed? So I've watched the first 26 episodes of Naruto about a decade after initially watching them. This time it's the subbed version because that's what Crunchyroll offers. Crunchyroll considers the first 26 episodes to be the first season even though Wikipedia lists the first 35 episodes as what makes the first season. On this issue I'll side with CR. So here I'm going to be talking about the first 26 episodes. If I'm wrong then tough noogies. In the first episode we are introduced to a boy who dresses up a lot like Goku from Dragonball Z (or an Auburn fan) and his name is Uzumaki Naruto. Unsurprisingly, he is the main character of this show. He's a bit of a flunky and a goofball and most folks in the Village Hidden in the Leaves don't like him. You see, when he was younger a terrible beast named the Nine-Tailed Fox was sealed within him by some dude called The Fourth Hokage. The Fourth Hokage died during this process and a lot of people were understandably bitter about that. Naruto was a child so it's not like he remembers it or could do anything about it. The Third Hokage made it a rule that no one could talk about the incident and that people should view Naruto as a hero, but the people of the village simply ignored or frowned upon the kid. These feelings were unintentionally picked up by the children of the villagers, too. As a result Naruto grew up without any friends at all. He didn't have parents, either. So all of his efforts to cause trouble (painting graffiti on the visages of the Hokages, as a for instance) are really desperate efforts to seek attention. 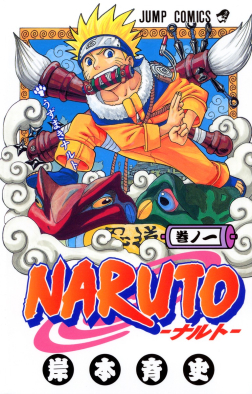 More than anything Naruto wants to become the best ninja in the land and eventually the next Hokage. That's kind of like saying that the tardy D-student wants to become a respected brain surgeon. Not exactly a realistic goal, but he wants the attention and respect of everyone and that's what he thinks he has to do in order to get it. Once he is teamed up with Uchiha Sasuke (*cough* Vegeta stand-in! *cough*) and Haruno Sakura (useless character alert! ), Naruto begins his journey to become Hokage. Of course, he's got to become a Genin first and that's an iffy thing with Naruto. Once he does though he and his team lead by the standoffish Hatake Kakashi (rank of Jonin) get to go on missions and stuff. Their first real mission comprises the bulk of the first season (Eps. 6-19) and it is the rather good Zabuza and Haku arc. An old man wishes to be accompanied to the Land of the Waves because he wants to be protected from gangs and thugs. Not so tough a mission, right? Well, Kakashi and his team of rookies accompany the old man, but things soon become complicated when Kakashi learns that it's not just gangs and thugs that are after the old man. The old man is building a bridge that will link the Land of the Waves to the mainland and yakuza boss Gato really doesn't want that because it would diminish the stranglehold he has over the village people. Gato hires the deadly renegade ANBU (Ansatsu Senjutsu Tokushu Butai = Special Assassinations and Tactical Squad) member Momochi Zabuza (called the "Demon of the Hidden Mist" for his mastery at silent attacks) and his faithful (and rather feminine-looking) companion Haku to take out the old bridge builder. Nope, those guys aren't just simple thugs. Naruto, Sasuke, and Sakura are sooo screwed. I remembered this part of the story well, but I forgot how much crying there was. Hell, not a lot of shows really pull out all the drama that soon. In some ways it make the rest of the show harder to watch because Zabuza is just such a badass villain (whether you watch him in the original Japanese with Unsho Ishizuka at the helm or in English with the brilliant Steven Jay Blum providing the voice... the effect is the same either way) that you keep wondering when the next baddie is going to show up and if he'll be able to top Zabuza in terms of menace. Hell, the arc as a whole leaves a lot for the rest of the show to live up to. Naturally, Naruto and the gang survive otherwise there wouldn't be 220 episodes, but for a while you could almost forget that. Until the next arc begins. In episode 20, Naruto and co. are given the chance to advance to the level of Chunin, but that just isn't going to be a cakewalk. They have to pass a very difficult written exam first and then enter the forest of death to prove their worthiness. Then they'll have to duel against the other aspiring-Chunin teams. That's later, though. Season one ends just before the Genin characters enter the forest of death. Episode 26 is a filler episode and not a good one at that. It recaps the events of the first season which is okay if it's been a while since the last episode, but even then the episode just kind of feels boring. Even for a recap episode. Not a strong ending to the first season or a strong beginning to the second season. But if I want to give this show some credit, I will say that Dragonball Z didn't even wait fifteen episodes before it started cranking out the filler. Oh, well. It's time for season two. I highly recommend the Zabuza arc of Naruto.